The United Nations Human Rights Condemn Jews for All The Evils In the World Council set up a Commission headed by South African Judge Richard Goldstone (an attempt on their part to give the illusion of impartiality) held hearings last week in Geneva. A delgation from Israel attended to give voice to the victims of Hamas’ violence. On July 6th, I traveled to Geneva to testify before the United Nations Fact Finding Mission on the Gaza Conflict. Participating in the delegations were Ashkelon Mayor Benny Vaknin, Dr Alan Marcus the director strategic planning branch in Ashkelon, Ophir Shinhar of Sapir College, and Dr. Mirelda Sidrer who was injured during a rocket attack on a medical facility at the Ashkelon mall. *From left to right: Ashkelon Mayor Benny Vaknin, Dr. Mirelda Sidrer, Hillel Neuer and Dr. Alan Marcus. The Israeli delegation also included Noam Shalit, who impassionedly spoke on behalf of his son, Gilad, who was abducted three years ago by Palestinian terrorists and has since been held by Hamas. The Israeli government officially refused to cooperate with the UN mission, since the UN investigation had already formulated conclusions asserting that Israel had committed war crimes during the December-January war. In preparation for the Geneva hearing, the UN mission invited the Sderot Media Center , a Sderot NGO, to prepare material, footage and information regarding the impact of the Gaza bombardment of the Israeli civilian population in the Negev during the Gaza war. The UN Mission aimed to at obtain an unofficial Israeli perspective. Before the UN hearing in Geneva, the Israeli delegation received a briefing from Hillel Neuer, head of NGO ‘UN Watch.’ Neuer provided background on the UN fact finding mission and the agenda of each judge on the UN investigating board. During the days leading up to the testimony, it was not easy to sleep – as the only resident of Sderot and the western Negev in this delegation, knowing that there would be only 30 minutes to convey how aerial terror has devastatingly impacted the civilian population of Sderot. At the same time, the UN afforded an opportunity for Sderot Media Center, which specializes in communicating the human story of Sderot and life under continuous rocket terror to decision makers around the world , to finally reach the UN. Why testify when the government of Israel itself has boycotted the investigation which already formulated it allegations against Israel before the investigation commenced? However, the presence of a UN invited delegation from Israel created a precedent. 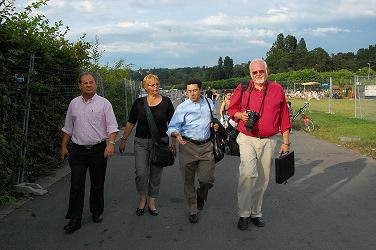 Hillel Neuer of UN Watch noted that never in the 16 years of operating in Geneva had there ever been a time when the UN invited and even sponsored a delegation from Israel to give testimony – until now. This time, the UN provided an opportunity for ordinary people from Israel to make their voices heard across the world. It was an honor as a resident of Sderot to partake in such an event. Yet the long road to peace and justice for Sderot and Negev residents does not end before a panel of UN judges or a commissioned report. Residents of Israel who act as witnesses to terror against the Jewish people, are obligated to speak up and convey the experience of what it is like to live under sustained rocket attacks-defined as a terror act and crime against humanity. *Noam Bedein in the main hall of the UN Headquarters before testifying. After screening two short videos in front of the panel of UN judges, which depicted the 15 seconds that Sderot residents and their children have to run for their lives when the rocket alarm is activated by impending Gaza rockets, I concluded my presentation with the following thoughts and questions. There were no questions or reactions from the UN judges. We will all have to wait, along with all the residents of southern Israel, to peruse the Geneva verdict on the war when the UN Mission report will be released in September. More facts or more blame? The three-week Gaza war has been keeping the UN obsessively busy with months of inquiries and a fact-finding mission into supposed Israeli war crime violations. In May, the UN came out with a report accusing Israel of “negligence or recklessness” in the Gaza war. UN Secretary-General Ban Ki-moon said he would seek compensation from Israel for damages amounting to $11 million to UN facilities. Led by Ian Martin, former head of human rights group Amnesty International, the UN inquiry said Israel was at fault for nine incidents where UN property was damaged. The 184-page report blamed Hamas for one case of damage, stating that a Palestinian rocket fired at a UN warehouse had caused $29,000 in damages, while attributing all other damages to Israel. Indeed, the report apparently did not point out the millions of dollars in damages that Hamas rockets caused in the southern region of Israel or call for an investigation into the nine Israeli schools that Gaza missiles struck during the war. Israel’s deputy UN ambassador Daniel Carmon told Reuters that the report was one-sided. “We were really shocked to see a report where the board is limiting itself to the facts of damages only, ignoring the context, ignoring that there is war against terrorism. According to The Australian, the UN inquiry apparently made no mention of the UN’s initial accusation that Israeli shells directly hit a UN school in Jabaliya, killing more than 40 civilians. UN officials accused the IDF of firing a mortar rocket at an UNRWA school on January 6, killing 43 people. CNN, France24, China Daily, Indian, Express BBC World, and the Israeli Haaretz all ran headlines stating that an Israeli strike Killed 40 people at UN School. The New York Times added the word “reportedly” in its headline. Only one international newspaper, the Canadian Globe and Mail came out three weeks later with a follow-up story to the UN allegation, entitled Account of Israeli Attack Doesn’t Hold up to Scrutiny. According to the Globe and Mail article, the teacher who was interviewed refused to give his name because he said UNRWA staff told him not to talk to news media. Only on February 2, 2009, did the United Nations finally admit that it had made a mistake – calling the misleading statements “a clerical error.” According to Haaretz, Maxwell Gaylord, the UN humanitarian coordinator in Jerusalem, admitted that IDF mortar shells fell in the street near the compound and not in the compound itself. “We would like to clarify that the shelling and all of the fatalities took place outside and not inside the school,” said Gaylord. Meanwhile, the damage had been done. The misleading UN statements and media coverage had led to international outrage with strong condemnations against Israel popping up everywhere. Not surprisingly, a clerical error of such significance was simply not deemed newsworthy by much of the international press. Except for the Canadian Globe and Mail, and Israeli newspapers including Haaretz, little international media coverage was given to Gaylord’s statements. By June, the UN Fact Finding Mission on the Gaza Conflict was spearheading another investigation. Led by South African Judge Richard Goldstone, the UN investigation has focused its investigation in Gaza, interviewing Hamas along with Palestinians. Israel has refused to cooperate in the investigation, citing anti-Israel bias by the investigation’s sponsor, the UN Human Rights Council, who has issued numerous reports on Israeli treatment of Palestinians but little on the Palestinian rocket terror impacting southern Israelis. The UN fact finding team includes Christine Chinkin, a law professor at the London School of Economics who signed an editorial published in the Sunday Times in January calling the Israeli offensive a war crime. Like usual Hamas will be looked upon as a victim of terror while the true victims will be condemned and vilified. Why? Because they are Jews. Because the world (especially those on the left) are upset that they stopped Hitler from destroying the Jews. Because the world would like to finish the job the great Muslim Savior: Adolph Hitler started, but never got to finish. You can help change this trend. You can write, call or e-mail your Congressman, your Senator, the President, your local newspaper. Tell someone how you feel about this! Remind them that Israel left Gaza in 2005 with the promise that it will bring peace, and that it was the Palestinians who kept attacking Israel, bring upon themselves the destruction that happened in Gaza. And if you are able to, you can support the Sderot Media Center. The few dollars you donate goes a long way. Just click here and follow the instructions. And please, remember the people of Sderot in your prayers. Pray for the peace of Israel. At Madaim Alon Elementary School, principal Leora Fima stands before her students, marking the beginning of Memorial Day for Israel’s Fallen service held at the school on Tuesday morning. The 160 students, from first grade to sixth grade, sit quietly in the school hall– one of the last areas of the school that remains unprotected by rocket attacks. When Principal Fima tells the students that the siren will go off at any moment in remembrance of Israel’s fallen, a first grader in the crowd asks if she means the Tzeva Adom, or Color Red siren warning of impending rockets. “No, a different siren,” responds Principal Fima. During the Gaza war, many schools in southern Israel including Sderot remained closed. 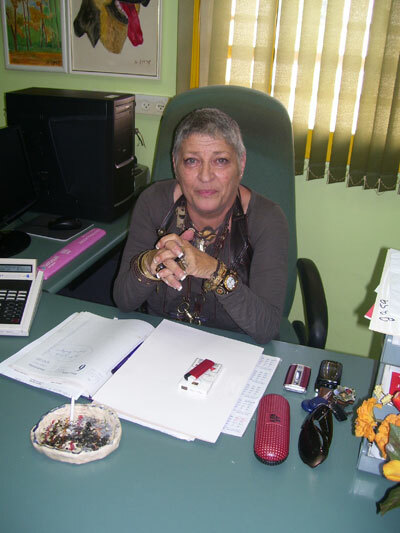 Madim Alon Elementary School is the only school in the western Negev which offers such counseling for students– many of whom suffer from PTSD symptoms that result from sirens and rocket attacks. “The kids here understand, perhaps better than anyone else, the meaning behind Remembrance Day for the Fallen of Israel’s Wars,” says Fima. Indeed, the hall was completely quiet as a Madaim Alon student read off the names of Sderot’s fallen soldiers during the ceremony. When the names of the Sderot residents killed by rocket attacks were called out loud, the silence among the children was almost deafening. “These kids have had to sacrifice so much already at such a young age. And yet they are not consumed by hatred or anger,” said Fima. Last week Madaim Alon held a Peace Day for its students in light of Operation Cast Lead. The elementary school students organized sessions exploring how the recent Gaza war affected everyone including Palestinian children, Fima explained. “There is a time for building bridges,” she says. While those living outside of Sderot may be under the impression that the ceasefire between Israel and Hamas is going well, Sderot and western Negev residents continued to experience rocket fire during the recent Passover holiday and Israel’s Memorial Day for fallen soldiers earlier this week. On Tuesday afternoon, April 28, the Tzeva Adom or Color Red siren blared throughout Sderot, sending residents racing to shelters. On Wednesday April 16, a Qassam rocket slammed into the western Negev, with another rocket following 24 hours later. 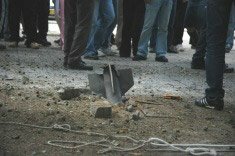 The second rocket was fired hours after the Israel Air Force struck a booby-trapped building in central Gaza. Both rockets landed in the Eshkol region of the western Negev, in an open an area, causing no reported injuries or damages. Since the ceasefire began on January 19, over 180 rockets including five grad rockets supplied by Iran, were fired at southern Israel according to the IDF spokesperson’s office. There has been a marked decrease in the number of rockets fired at Israeli civilians since Operation Cast Lead. According to the IDF Chief of General Staff Lt.-Gen. Gabi Ashkenazi, Hamas has been deterred from firing Qassam rockets into Israel since the operation. “It is not coincidental that there is no [Kassam] rocket fire from Gaza, but we know that terrorism or attacks along the border fence, by sea or from the Gaza Strip into the Sinai Peninsula, are still on the agenda and we are therefore preparing with all the necessary measures,” Ashkenazi stated on Monday, April 16, as reported by the Jerusalem Post. 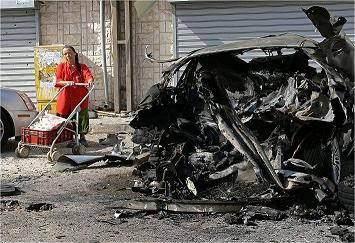 Other terrorist activities have continued in Gaza. On Thursday April 13, Egyptian officials arrested nine Sinai Beduin near the Gaza border on the suspicion of smuggling weapons, merchandise and money to Hamas. Two of the suspects were caught at the Rafah border crossing in possession of more than $90,000. Egyptian police had discovered the day before 900 kilograms of TNT hidden in 18 sacks near the Gaza border. Egyptian authorities also arrested three Palestinians on suspicion of infiltrating into the country. On April 13, the Israeli Navy spotted an unmanned Palestinian fishing boat off the coast of the Gaza Strip. The boat was loaded with hundred of kilograms of explosives and remotely detonated as it approached an Israeli Navy ship, which distanced itself away from it. The fishing boat exploded seconds later, injuring no one. In the past, Palestinian have tried to detonate explosives-laden ships next to Israel Navy vessels. According to the Jerusalem Post, four Israeli sailors were wounded in 2002 when Palestinian detonated a fishing boat next to a navy patrol off northern Gaza. In October 2000, a small ship exploded next to the USS Cole in Yemen, which killed 17 American sailors. Also last week, Egyptian authorities cracked a Hezbollah-run terrorist ring based in Egypt. Thanks to intelligence information provided by Israel’s Mossad and other foreign intelligence services including the CIA, the crackdown led Egyptian authorities to arrest dozens of suspects on Thursday April 16. According to Ha’aretz, the head of the ring was Lebanese citizen Sami Shihab who was in touch with a special branch of Hezbollah for some time. Egyptian security sources said that the Hezbollah agents had planned a series of terrorist attacks against tourist sites in Sinai where western and Israeli tourists frequent. Egptian sources also noted that the Suez Canal was a target of the ring. Egypt had been hunting for 13 members of the 49 member Hezbollah ring which included Lebanese and Sudanese citizens for some time. The men had taken shelter in the central Sinal town of al-Nakhl and authorities had feared that the men might escape north into Gaza located 120 miles away through secret tunnels or head further south. The world does not care that over a million people live under the daily threat of rocket attacks from an entity that has sworn to kill each and every one of them. Instead it applauds and rewards the purveyors of the terror with massive amounts of financing in the guise of aid. The Obama administration alone has pledged to give $1.1 billion to help Gaza. US taxpayer funds that will go straight into the hands of Hamas. Obama is even orchestrating the means to put it directly into Hamas’ hands. Funds that will not go to the people of Gaza, but to purchase the weapons of terror. If you feel that funding terror is against the principles that this nation was founded on, then write Congress and let them know that. Let them know that you stand tall with the people of Sderot. That you do not want your tax dollars given to a known terrorist group. That $1.1 billion could be spent better here at home. Just don’t be silent! And like always, I ask you to donate to the Sderot Media Center. Just click on the logo at the top or bottom of this post. 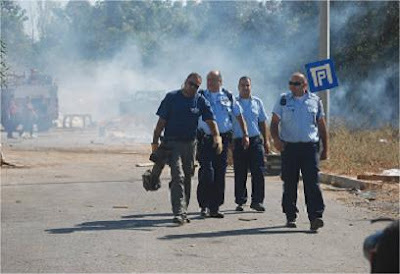 It is time that the sirens fall silent over Sderot! Today Israel marked Holocaust Remembrance Day. Standing on a street in Sderot, I listened quietly to the siren sound, remembering the tragedy of 6 million Jews killed in Nazi Europe, my great grandparents, uncles and aunts from Poland among them. I’ve become used to sirens sounding in Sderot during my past two years here-the click of the intercom, followed by a female voice that calmly repeats Tzeva Adom, Tzeva Adom, or Color Red. The scenes that unfold usually entail people dashing into shelters-racing for 15 seconds that may mean the difference between life and death. But now at this moment, the Holocaust siren gives me a moment to reflect. I watch passerby’s stop, Ethiopians, Russians, Uzbekistanis, Moroccans, Persians and the like; Israeli Jews from countries around the world who make up Sderot’s colorful cultural tapestry. We stand together to remember the tragedy of silence that cost the lives of so many innocent people in our nation. It is this tragedy of silence which probably strikes hardest here in Sderot. Eight years of Qassam attacks have wounded over 1,000 Israelis, destroyed hundreds of Jewish homes, and have left thousands of children psychologically traumatized. Today close to one million Israelis in southern Israel live under the threat of Palestinian rocket attack thanks to the financial aid and embedment from Iran. Who will speak up for these Israelis who continue to be the targets of radical Islam in the form of Hamas rocket terror? Sderot is targeted not because it is a city outside the 1967 green lines, nor because of an army base located in the city. Sderot is part of the UN Partition Plan of 1948 with a civilian population of 19,000, where over 5,000 residents have been forced to flee since Palestinian rocket fire began on the city in 2001. Sderot is targeted simply because it is a Jewish city on the frontlines of Israel-an easy target for Palestinian terrorists who seek Israel’s destruction. THE greatest testimony that the world is once again returning to its apathetic state of silence that defined the era of Nazi Germany was revealed no less ironically today at the Durban II conference when Iranian President Ahmadinejad was invited as a guest speaker. Moreover, Hans-Rudolf Merz, the president of Switzerland, a country that declared its “neutrality” during the Holocaust, agreed to meet with Ahmadinejad, who is a fervent Holocaust denier and has repeatedly called for the destruction of Israel. Ahmadinejad’s presence at Durban II is symbolic in that there has been no overwhelming international outcry against his views or the fact that he was invited to speak at the UN conference on racism. Iran is considered the greatest threat to Israel’s survival. Although Iran, an oil-rich country, continues to claim that its nuclear program is meant to produce electricity, it remains clear to Israel that Tehran is intent on building nuclear weapons that could potentially cause massive destruction to the state. SDEROT residents have been the silent targets of Islamic terror for too long. Last year on the eve of Holocaust Remembrance Day, 13 rockets fell upon Sderot. Although rocket fire has significantly decreased since Operation Cast Lead, close to 200 rockets have still been fired at the western Negev region. If Israel does not effectively stand up for her citizens at home, who will stand up for Israel in the world? As countries across the world show alarming acceptance of a blatantly anti-Semitic figure like Ahmadinejad, demonstrated in Durban II, the state of Israel and the Jewish people cannot allow silence to become a national policy in the face of anti-Semitic terror, be it rockets or rhetoric, at home or abroad. In 1938 the world did nothing, said nothing while Hitler and his thugs accelerated Germany’s slide into the madness that was the ‘Final Solution‘. We witnessed on Monday 100 nation rise and applaud Ahmadinejad in Geneva. There is only one nation that speaks for Israel and Jews around the world. It is Israel. It is a shame that the world has decided to turn its back and closed its ears to the cries of pain and anguish from Israelis. It is only Palestinian tears that matter to the world. But I pray not to you, truth seeker. I once again ask you to remember the people of Sderot, and Israel in your prayers. To sign up for Code Red Alerts. To contact you Congress Representatives, Senators and President Obama. Contact your newspapers, radio, and other media outlits. And if you are able to, donate a few coins to the Sderot Media Center. Just click on the logo at the top or bottom of this post and follow the directions from there. It is time that the people of Sderot and Israel start having a loud voice screaming out their story too. Hamas is continuing to rearm itself two-and-a-half months after Operation Cast Lead, said Yuval Diskin, head of the Israel Security Agency (Shin Bet). More than 22 tons of explosives, hundreds of mortar shells, dozens of rockets and anti-tank missiles and 45 tons of raw material to manufacture arms, have been smuggled into the Gaza Strip. Diskin added that Egypt is doing its part prevent the smuggling, but that the smuggling under the Philadelphi Corridor between Egypt and the Gaza Strip continued unabated. Hamas is concerned about an escalation in its confrontation with Israel, especially in light of the freeze in talks for a prisoner exchange and the failure so far of its reconciliation talks with Fatah, Diskin said. An additional round of Hamas-Fatah reconciliation talks was expected to be held Tuesday and Wednesday in Cairo, but nothing was expected to come of it, he said. “The difference between the two sides is great,” Diskin said. Diskin, in his last briefing to the current government, said there had been a marked decrease in the number of rocket attacks on the western Negev. “There is indeed a drop in rockets, only one rocket from a small organization was fired in recent days. There are two reasons for this: Hamas is not interested in an escalation or another confrontation with Israel, and as a result, Hamas is carrying out arrests before attacks,” said Diskin. Diskin also stated that Hamas was taking measures to stop small organizations from firing rockets and had signed an agreement with Islamic Jihad to prevent rocket fire for the short term. Nevertheless, Diskin warned that the small terrorist organizations were plotting to kidnap soldiers, and were also planning attacks inside Israel – either via Sinai, or with the aid of terrorist organizations in Judea and Samaria. No child should have to live in fear on a daily basis. Every child should have a chance to grow up in a happy, healthy environment. But the world is all to ready to allow the Jews of Israel, especially those living in Sderot, to suffer these attacks on a daily basis. The EU is to be commended for the mandate that it has undertaken to help civilians whose lives have been affected by the recent Gaza war. EU member states remain well aware of the suffering and economic challenges that exist on the Palestinian side of the Gaza conflict. The EU remains the most significant financial donor to the Palestinian civilians affected by the war. In 2008 alone, the EU provided almost 500 million Euros for the health and welfare services to the Palestinian population in Gaza.Yet on the other side of the Gaza war, EU humanitarian aid workers may not be aware of the devastating toll that the Gaza war has taken on the lives of thousands of Israeli civilians who have endured eight years of daily rocket explosions and siren warnings. Writing from the perspective of an NGO in Sderot where I have worked and lived for the past 2 years, I have witnessed and written about countless homes destroyed, children maimed, and families torn apart by the impact of these lethal attacks. This is a reality where bomb shelters, which dot the entire city, are used almost daily. Life in Sderot is measured by 15 seconds–the time one has to race to bomb shelter when the siren goes off to warn of impending rockets. A recent study found that more than 80% of Sderot children suffer from PTSD symptoms-post traumatic stress disorder. The long term psychological damage inflicted by the constant rocket fire on both adults and children alike has not yet been fully comprehended or addressed. Although Sderot has no medical center (residents who are wounded by rockets must be transferred to the Barzeli hospital in Ashkelon located 20 min. away) a Sderot Mental Health Center, under the auspices of Barzeli hospital does exist, and is run by Dr. Adrianna Katz. The Mental Health Center has become a vital service for the Sderot community, providing psychological treatment to those suffering from PTSD and those who enter shock after experiencing a rocket explosion. The center has only four full time workers to help provide mental health services to almost 5,000 people in Sderot who have been diagnosed with severe mental health stress that has resulted from the anxiety of life under rocket attacks. The Sderot Mental Health Center needs immediate financial aid to ad staff and to service such a large community of patients. Providing psychological therapy for Sderot high school students by the avenue of the arts and theater, Sderot Community Theater Therapy reaches out to young people in Sderot to help them express their fears and anxieties of life under rocket fire. The high school students creatively produce dramatic presentations, under the guidance of a theater director and psychologist. With the understanding that the EU will address the humanitarian needs of all sides of a war zone, it would be a welcome gesture if the EU would help provide funds to the mental health services of Sderot and the Western Negev. Such financial assistance is vital to the restoration of normal life for future generations of southern Israelis. I fear that Anav Silverman’s words will be falling on deaf ears. For many of us in the US have witnessed these last few years is Europe’s embracing of the Palestinian cause and ignoring the suffering that the Palestians are doing to innocent Israeli children. You don’t have to be silent though. You can help. Remember Sderot and the people of Southern Israel in your prayers. Sign up for Code Red alerts here. Contact your congressman and Senators, reminding them of the United State’s commitment to Israel. And if you are able to, donate a few dollars to the Sderot Media Center. Just click on the logo at the top or bottom of this post. Every child deserves a happy and safe childhood!